When working from home I usually have my desktop cranked up and I RDP into my workstation at work. Usually my laptop would sit on my desk collecting dust. But then I realized I could leverage the extra laptop monitor for something (Skype, IM, etc) so I started using it but there was a disconnect when something happened on the laptop. I'd have to shift my focus (and hands) over to the laptop keyboard to interact. Ugh. 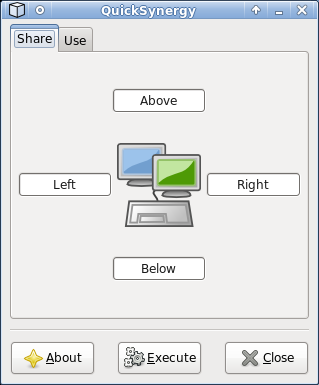 Synergy is Free and Open Source Software that lets you easily share your mouse and keyboard between multiple computers, where each computer has its own display. No special hardware is required, all you need is a local area network. Synergy is supported on Windows, Mac OS X and Linux. Redirecting the mouse and keyboard is as simple as moving the mouse off the edge of your screen. Synergy is released under the GNU Public License (GPL). You basically have a client/server relationship and once configured correctly you can easily share your mouse and keyboard between systems - even if they are using different operating systems! On my Windows 7 laptop I downloaded and installed the Synergy software. It would be the 'client' so I selected "Use another computer's keyboard and mouse (client)" and entered my desktop IP address. You can also set Synergy to automatically start when the computer starts or when you login. That's it for the client. Note: The one 'drawback' I've found is if you normally use DHCP to set your IP addresses you may need to give them a static address to make configuration easier. On my Linux desktop Synegy was available via Apt but I quickly realized that it was a simple CLI interface. Digging around however I found QuickSynergy which gives you a very simple GUI to manage your settings. I first attempted to enter an IP address but that failed. For some reason Synergy is expecting a host name. So in my case my laptop host is "JIM-PC". My laptop is sitting to the left of my main monitors so I entered "JIM-PC" in the 'left' text box, click Execute and viola! I can now move my mouse between systems simply by dragging it to the edge of my far left monitor. I have another old PC I've been considering setting up as a 'server' at home. All I need for it is a monitor (would go on the right) and then I could easily access 3 machines, 4 monitors all from a single keyboard and mouse!